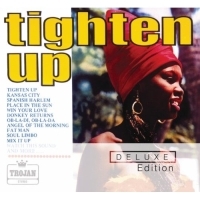 Seminal UK reggae compilation Tighten Up is reissued as a 2CD set today. The ‘Deluxe Edition’ of the first LP of the Trojan Records series features a whopping 36 bonus tracks from the era, on top of the 12 from the 1969 original tracklisting. Plus this new release has a lavish 20-page booklet about the artists and the history of the series. Essential listening for the summer, we’re sure you’ll agree. Tighten Up deluxe edition is out now on Sanctuary and costs £12.99 from Amazon here.